It is for these reasons why tourism is a booming trade in this part of the country. Whether you’re a local or a tourist, there are some experiences which you can only find in the province of Cebu. While Cebu is mostly known for its many pristine beaches, a lot of people aren’t aware that it’s also home to this many natural waterfalls. They come in all shapes and sizes – tall, narrow, wide, short, multi-tiered, segmented, and horsetail. In and around Cebu city, there are about 30 waterfalls. In Southern Cebu province, there are about 50 waterfalls to visit. Meanwhile, in Northern and Western Cebu, there are about 20. 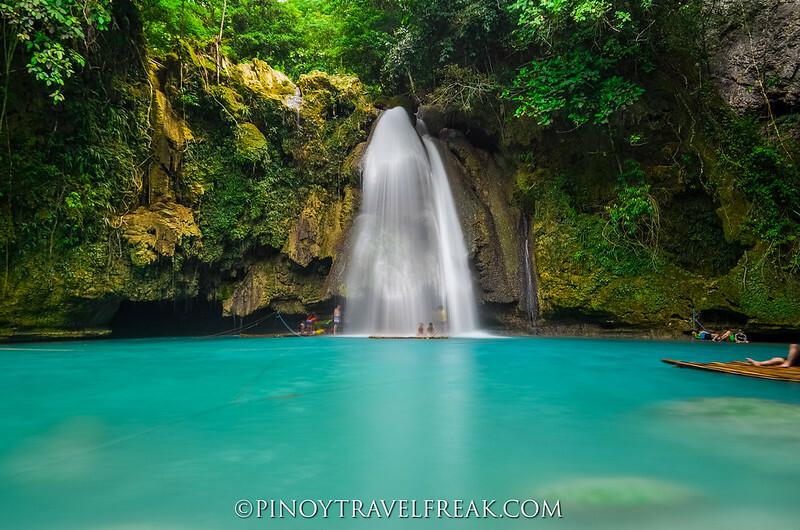 Check out our list of the waterfalls here on Pinoy Travel Freak, make a checklist, and ask the local guides which ones can be visited in organized treks. On the southeastern tip of the island of Cebu lies Oslob, a municipality whose locals have developed a rapport with the whale sharks in the area. While these gentle sea giants can be found in various areas around the island archipelago, swimming with them is one of the truly unique experiences that you can only get in Oslob. And don’t worry – the local guides are well aware of how the whale sharks behave and each tourist who is allowed near the animals are first taught the proper ways to interact with them harmlessly. This includes not feeding them, not using flash photography, leaving no trash behind, and never touching them because their reaction to human touch can be unpredictable. Around the World With Justin states breaking these rules come with strict penalties and sometimes even jail time. Being the economic hub that it is, Cebu is home to local delicacies that you might not be able to find anywhere else. The about 100 reviews on Trip Advisor attest to the wide variation of dried and fresh seafood that can be found at the Taboan Public Market, including squid, anchovies, danggit, and bulad. Other delicacies include local nuts, Cebu’s famous dried mangoes, otap, and the sweet and nutty, masareal. There are also key chains and other small souvenirs that you can take home with you. If you’re looking to spend some money, do it at Taboan Public Market. You might even get to test out your haggling skills here as most vendors are open to negotiations. Yes, beach hopping is something that you can do in many places in the Philippines. However, what makes Cebu’s beaches unique is the fact that they’re not just pretty – each beach comes with a story that reveals some insight into the Philippines’ past. For instance, Mactan Island is also geographically a coral island, which means that it offers some of the most idyllic diving locations in the area. Historically, Mactan is also the island on which the famed Portuguese explorer Ferdinand Magellan arrived, only to be killed in a skirmish with DatuLapu-Lapu and his wariors. Almost all of the 7 Must-Visit Beaches in Cebu are steeped in local lore and history. This annual festival happens every January. Historically, it’s a celebration of Cebu’s acceptance of Catholicism and reverence for the infant Jesus aka the Santo Niño. Local carrier Philippine Airlines makes daily flights from Manila to Cebu, and this is especially important during the time of the Sinulog Festival as locals and international travelers flock to the most important cultural highlight of the Cebuano year. Every year, both tourists and locals look forward to the colorful costumes, dancing, and wild street parties that have come to define each iteration of the annual festival.